If you are interested on applying to this role, please send your CV to nporto@swiftwwr.com, with the name of the position on the subject and your salary expectation. SWIFT recruta para trabalhar em uma EXCELENTE multinacional na área de petróleo, gás e naval. Interessados enviar currículo em inglês paramgrego@swiftwwr.com com pretensão salarial, utilizando no assunto o nome da vaga em questão. If you’re interested, please send your resume in English to blopes@swiftwwr.com with expected salary. Nosso cliente é uma multinacional em busca de técnicos ou engenheiros de fluidos de perfuração para se unir a seu time. O candidato trabalhará embarcado no regime 14x14, se reportará ao coordenador de base e será responsável pelo acompanhamento das operações de perfuração no que tange aos fluidos fornecidos por essa empresa. Busca-se pessoas detodos os níveis e tempo de experiência. Será considerado um grande diferencial a realização docurso de fluidos e inglês avançado. Interessados favor me enviar o cv. Necessário ter conhecimentos de subcontratações. Interessados, favor encaminhar currículo para mara.torres@estaleiro-brasa.com.br, preenchendo o campo assunto com ADVOGADO. Encaminhar currículo para mara.torres@estaleiro-brasa.com.br preenchendo o campo assunto com “QA Assistant“. If you are interested on applying to this role, please send your updated CV and expected salary tommonteiro@swiftwwr.com, mentioning the position title on the subject. - Supervise delivery of all equipment and personnel to and from the rig, as required by the lead Drill Site Manager. - Work with shorebase logistics personnel to ensure proper coordination of MODU equipment and personnel requirements. - Compiles, verifies or assists in the compilation of all materials and personnel movements documentation, including manifests, returns notes, TDG documentation etc and maintains comprehensive and accurate records of all material inventory, rental equipment and material movement’s to/from the installation. - Ensures compliance with Company’s marine, aviation and other logistical policies and procedures. - Maintain record of CCU utilization and movements, and conducts inspections of CCU’s and the packing and stowage of all materials shipped from the MODU. - Assist OIM / lead DSM in Medivac and emergency situations. - Verify that copy of Material Safety Data Sheet accompanies chemicals that are expedited to and from the rig. - Coordinate with crane operators and crews what is planned to be coming out to the rig and what needs to be loaded going back. - Verify that water, fuel, barite and cement inventories are posted daily and have the knowledge and foresight to see when more might be needed. 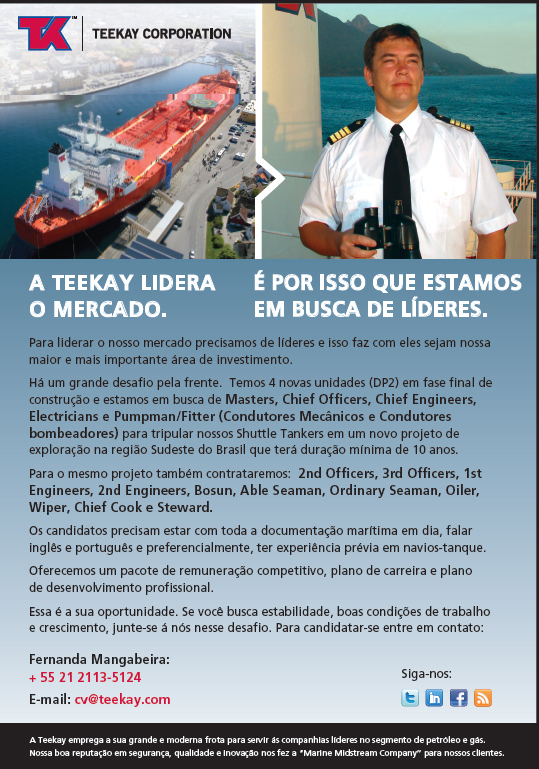 -Liaison with vessels operating in the field. - Plans and maintain crew change rota for Company offshore personnel and contractors. -Plans and manages all offshore marine and helicopter operations, personnel movements, crew changes and POB control on a daily basis. Monitors Helideck operations for compliance with Company standards. - Knowledge and qualifications in marine and aviation operations, inventory control, transportation and other logistics services, with basic accounting and administrational skills. - Functional working knowledge of drilling materials and equipment and general offshore operations preferably gained through actual offshore work. - Fluent in both English and Portuguese. - Senior offshore industry experience, minimum 3 years experience in a logistics role. - Formally trained and qualified in TDG, Cargo Handling and CCU/Sling Inspection. - Computer literate, with a good working knowledge of various Microsoft Office applications and PLS POB, materials and logistics management systems. If you are interested on applying to this role, please send your updated CV and expected salary to mmonteiro@swiftwwr.com, mentioning the position title on the subject. Candidatos interessados devem enviar CV para tmelo@swiftwwr.com com pretensão salarial e o nome da vaga no assunto. Candidatos interessados devem enviar o CV atualizado em inglês com pretensão salarial paratmelo@swiftwwr.com , mencionando o nome da vaga no assunto.